Bring on 2019 and the 24th Byron Bay Tri! On Saturday 11 May 2019, escape to incomparable Byron for an iconic multi-fun weekend. With a proud history spanning over 20 years, the Byron Bay Triathlon has built its reputation by attracting a wide range of triathletes young and old, professional and amateur alike to one of the nations most iconic and memorable locations. Position at the end of the Triathlon Australia season, the Byron Tri is a celebration of the sport and the locale a memorable and truly Byron experience that is like no other. Bragging rights and stories to tell! The Byron Bay Tri is regarded by many as one of the friendliest triathlons on the coast. 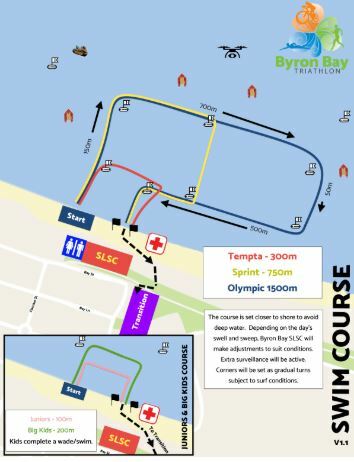 Competitors enjoy a 1.5km ocean swim in the crystal clear, tranquil waters of Byron Bay; a 40km cycle past rainforest, coastal bush and the gently rolling farmland of Northern NSW; then top it all off with a run along the foreshore, under the picturesque Byron Bay Lighthouse. The swim leg is an ocean swim, following the shallow shoreline and set just outside the surf zone. The Byron Surf Life Saving Club do a wonderful job lining the course and providing water safety. Little Rippers help with drone surveillance from the air. 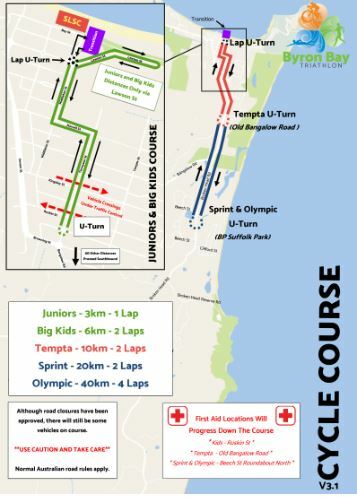 The bike leg is an out and back course from the Main Beach Transition Area south along The Coast Road towards Suffolk Park. The run leg is a scenic course along the foreshore, which loops from the Surf Life Saving Club out and back. For those young ones who are keen to have a go. Try it for fun, leave as a hero! 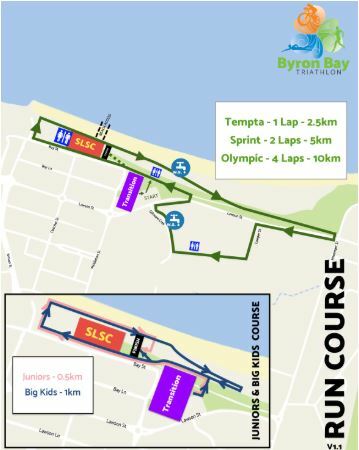 The Byron Coast Real Estate Kid’s Triathlon is a fully supervised and coaching event with officials, lifeguards and volunteers supporting and coaching the kids every step of the way. However, your child is welcome to sit out of the swim if they are still not comfortable. Please note that as per Triathlon Australia regulations, ages are determined as of age on 31 December 2017. For older kids or first timers to triathlon. While some people are competitive, the greater majority of participants are just starting out. Everyone is welcome even if it is your first swim or ride. new format race designed to pick up the speed, due to the shorter distance of the swim, ride and run. For athletes who have done one triathlon or those who are a little more serious about their personal best times. Race in your age groups. Registration is planned to open on Friday evening from 5.00 PM – 7.00 PM at the Byron Surf Club on Bay Street. If you can’t make it on Friday evening, you can sign on and rack on the day from 8.00 AM and until 11.00AM. Bike racking is only available on Saturday morning. Bike Sticker – This is a small sticky label with your number on it. Bib Number – Put this on your shirt (front) with safety pins or on your race belt. Timing band – Around your left ankle. Swim cap – Make sure it is the right colour for your wave. Byron Bay is located just 7km off the Pacific Highway. It is approximately 1 hour and 45 minute drive south from Brisbane or 3 hour drive from Coffs Harbour. If you come by car please be aware that there are strict parking restrictions in the Byron Shire. Byron Bay is serviced by the Ballina Airport which is only a 30-minute drive south and Gold Coast Airport just 45 minute drive north. Jetstar, Virgin and Rex airlines all fly to these destinations. Local shuttle bus companies can arrange your transfer from these airports to Byron Bay. Byron Bay is also regularly serviced by the Greyhound, Premier Motor Service & Countrylink bus companies. All buses arrive at the tourist information centre in the middle of town. With the race taking place over a fairly small area there are lots of places to see your athlete multiple times - just please remember that there will be road closures in place so it is imperative to get to the course early. If you have any interest in getting involved on the event day by donating your time, please email [email protected] or call our office on 1300 28 29 49. What if there is poor swimming weather conditions? In the event of poor weather conditions inhibiting competitors from completing the swim, a beach sprint will be conducted in place of the swim. Aid Stations and supporters line the course to cheer you on your final journey to the finish line. All individuals on the team must either have a current Triathlon Australia license at the date of the race or purchased a One Day Membership and the individual is responsible to ensure their insurance is up to date or they will be uninsured. A great team event for a group of friends. Some take it seriously and some just do it for the beers afterwards! The relay requires the timing band to be passed on from one athlete onto the next. Each team must consist of three mates, adversaries….who all start together and finish together. The time of the team is calculated when the last team member crosses the line. So this is about training together, racing together and finishing together. How was Byron Bay Triathlon? 2018 marks the 12th annual Byron Bay Lighthouse Run, supporting Crackin Cancer and the Mai Wiru Foundation on October 14, 2018. The Byron Bay Lighthouse Run is a 10km run or a 6km walk starting at 7am at Clarkes beach in Byron Bay.